An exoplanet orbiting a star that entered our Milky Way from another galaxy has been detected by a European team of astronomers using the MPG/ESO 2.2-metre telescope at ESO’s La Silla Observatory in Chile. The Jupiter-like planet is particularly unusual, as it is orbiting a star nearing the end of its life and could be about to be engulfed by it, giving tantalising clues about the fate of our own planetary system in the distant future. Over the last 15 years, astronomers have detected nearly 500 planets orbiting stars in our cosmic neighbourhood, but none outside our Milky Way has been confirmed . Now, however, a planet with a minimum mass 1.25 times that of Jupiter  has been discovered orbiting a star of extragalactic origin, even though the star now finds itself within our own galaxy. 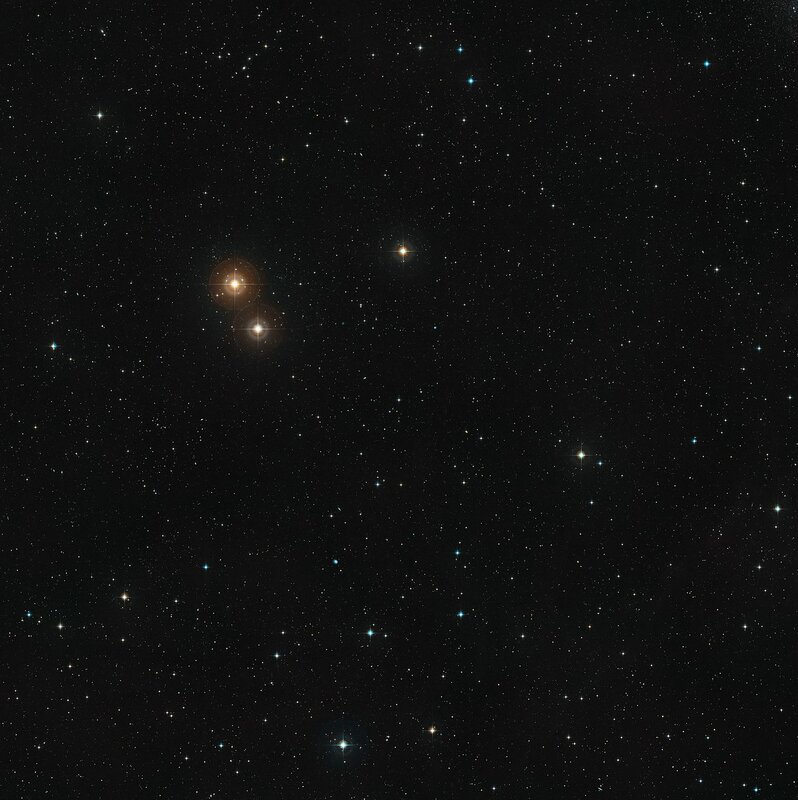 It is part of the so-called Helmi stream  — a group of stars that originally belonged to a dwarf galaxy that was devoured by our galaxy, the Milky Way, in an act of galactic cannibalism about six to nine billion years ago. The results are published today in Science Express. The star is known as HIP 13044, and it lies about 2000 light-years from Earth in the southern constellation of Fornax (the Furnace). 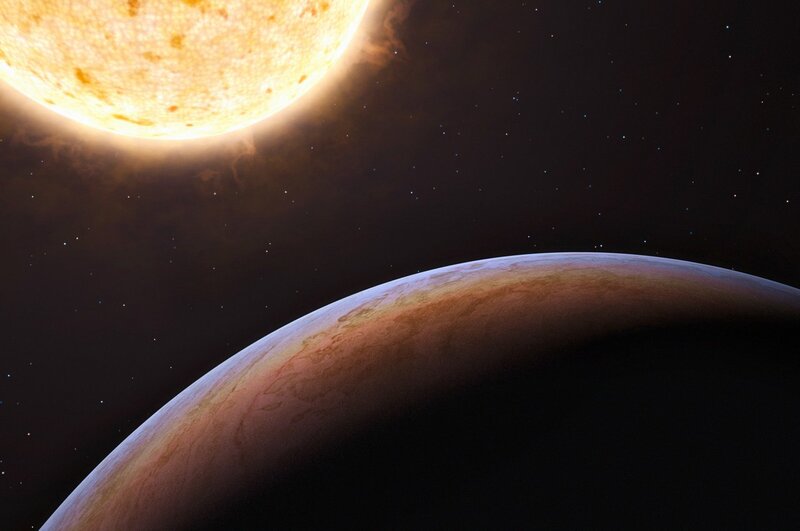 The astronomers detected the planet, called HIP 13044 b, by looking for the tiny telltale wobbles of the star caused by the gravitational tug of an orbiting companion. For these precise observations, the team used the high-resolution spectrograph FEROS  attached to the 2.2-metre MPG/ESO telescope  at ESO’s La Silla Observatory in Chile. Adding to its claim to fame, HIP 13044 b is also one of the few exoplanets known to have survived the period when its host star expanded massively after exhausting the hydrogen fuel supply in its core — the red giant phase of stellar evolution. The star has now contracted again and is burning helium in its core. Until now, these so-called horizontal branch stars have remained largely uncharted territory for planet-hunters. HIP 13044 b is near to its host star. At the closest point in its elliptical orbit, it is less than one stellar diameter from the surface of the star (or 0.055 times the Sun-Earth distance). It completes an orbit in only 16.2 days. Setiawan and his colleagues hypothesise that the planet's orbit might initially have been much larger, but that it moved inwards during the red giant phase. Although HIP 13044 b has escaped the fate of these inner planets so far, the star will expand again in the next stage of its evolution. HIP 13044 b may therefore be about to be engulfed by the star, meaning that it is doomed after all. This could also foretell the demise of our outer planets — such as Jupiter — when the Sun approaches the end of its life. The star also poses interesting questions about how giant planets form, as it appears to contain very few elements heavier than hydrogen and helium — fewer than any other star known to host planets. “It is a puzzle for the widely accepted model of planet formation to explain how such a star, which contains hardly any heavy elements at all, could have formed a planet. 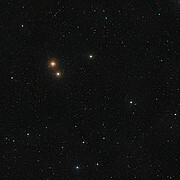 Planets around stars like this must probably form in a different way,” adds Setiawan. There have been tentative claims of the detection of extragalactic exoplanets through “gravitational microlensing” events, in which the planet passing in front of an even more distant star leads to a subtle, but detectable “flash”. However, this method relies on a singular event — the chance alignment of a distant light source, planetary system and observers on Earth — and no such extragalactic planet detection has been confirmed. Using the radial velocity method, astronomers can only estimate a minimum mass for a planet, as the mass estimate also depends on the tilt of the orbital plane relative to the line of sight, which is unknown. From a statistical point of view, this minimum mass is however often close to the real mass of the planet. Astronomers can identify members of the Helmi stream as they have motions (velocity and orbits) that are rather different from the average Milky Way stars. FEROS stands for Fibre-fed Extended Range Optical Spectrograph. The 2.2-metre telescope has been in operation at La Silla since early 1984 and is on indefinite loan to ESO from the Max-Planck Society (Max Planck Gesellschaft or MPG in German). Telescope time is shared between MPG and ESO observing programmes, while the operation and maintenance of the telescope are ESO’s responsibility. This research was presented in a paper, “A Giant Planet Around a Metal-poor Star of Extragalactic Origin”, by J. Setiawan et al., to appear in Science Express on 18 November 2010. The team is composed of J. Setiawan, R. J. Klement, T. Henning, H.-W. Rix, and B. Rochau (Max-Planck-Institut für Astronomie, Heidelberg, Germany), J. Rodmann (European Space Agency, Noordwijk, the Netherlands), and T. Schulze-Hartung (Max-Planck-Institut für Astronomie, Heidelberg, Germany).